The number of net-zero energy buildings — buildings that use renewable energy technology to help meet 100 percent of their energy needs — doubled between 2012 and 2014 in the United States, according to the New Buildings Institute, and this trend is expected to continue. Achieving net-zero energy in your home or business may sound ambitious, but as sustainable building materials and technologies become more prevalent and more affordable, the building industry is embracing this green building trend and making a commitment to sustainability. Net-zero energy buildings are those that have generally achieved the highest levels of LEED certification. LEED certification is a great goal to set for any sustainably built project — regardless if the building achieves net-zero energy status — and helps minimize the project’s energy bills and carbon footprint. LEED, short for Leadership in Energy & Environmental Design, is the U.S. Green Building Council’s certification program that recognizes best-in-class green building strategies and practices. To achieve LEED certification, building projects must satisfy prerequisites and earn points to achieve different levels of certification. Projects earn points through sustainable practices in materials selection, water efficiency, energy performance, site management and more. Certification levels are ranked by points at four levels from "certified" to "platinum." The U.S. government and many state governments provide incentives — and sometimes requirements — for builders to achieve a certain level of LEED certification for new projects. For example, the U.S. GSA (General Services Administration) has increased its minimum requirement for new construction and substantial renovation of federally owned facilities to LEED Gold. The principles for Cradle to Cradle® certification include sourcing materials safe for humans and the environment, powering the manufacturing process with renewable energy, and ensuring that these products are recycled at the end of their life. Another key requirement of Cradle to Cradle certification is the promotion of responsible and ethical practices throughout our supply chain, employees and communities. University of California, Davis, (pictured at top) describes West Village as the largest planned net-zero energy development in the U.S., demonstrating that net-zero energy is practical on a large scale. Located on the UC Davis campus, West Village combines advanced energy efficient design with a 4-megawatt SunPower solar power system. The 130-acre project includes apartment housing for 2,000 students, an education center for Los Rios Community College, recreation and study facilities, a village square surrounded by neighborhood-serving retail and 343 single family homes for faculty and staff. The development integrates sustainable design to enable those living in the community to reduce their reliance on automobiles, limit energy consumption and enjoy the benefits of the local climate. Building designs optimize solar orientation, utilize energy efficient appliances and incorporate materials from renewable sources. The SunPower solar power system generates the equivalent of 100 percent of the community's electricity demand. The system is comprised of both rooftop solar power installations as well as solar canopies installed in parking areas. In addition to the SunPower system, UC Davis West Village integrates energy conservation elements to reduce energy use, exceeding current building standards by 50 percent. The design of the Bullitt Center (pictured above), a six-story, 53,000-square-foot net-zero energy commercial office building in Seattle, went well beyond LEED Platinum requirements to achieve full Living Building Certification. It is so robustly constructed that it is expected to have a 250-year lifespan. In collaboration with Solar Design Associates, the Bullitt Center design team ran more than 50 solar array configurations to find the best product and layout for maximum power production. They selected SunPower panels for their exceptional efficiency, durability and sustainable manufacturing practices. There are 575 high-efficiency SunPower panels on the roof of the Bullitt Center. For much of the year, the building’s SunPower solar array produces more energy than it needs, contributing energy back to the power grid and receiving credit through net metering. During the winter, the building draws some energy from the grid, but net energy usage evens out annually to net-zero. The Willow School, Gladstone, N.J. The Willow School (pictured above) is a private Pre-K-8 school in Gladstone, N.J. Every building constructed on the campus is greener than the last. The Schoolhouse building, which opened in 2002, was the first LEED® Certified™ Gold school building in the country. The Barn was the second building on the campus, and it became the first LEED Certified Platinum building in New Jersey by incorporating salvaged material, natural daylight and rooftop SunPower solar panels. The school’s newest building, the Health, Wellness & Nutrition Center, was certified LEED Platinum and is expected to secure certification under the Living Building Challenge™, regarded as the world's most rigorous building performance standard. One of the key components of the Living Building Challenge is achieving energy neutrality. A SunPower solar system, installed by SunPower dealer Geoscape Solar, provides 100 percent of the power for the facility and about 25 percent of the rest of the campus’ energy needs. The Center’s SunPower system, combined with innovative water conservation, waste management, temperature regulation and natural lighting strategies, make the building an incredible example of optimal green building practices. The California Academy of Sciences is a truly unique green building, with a “Living Roof” surrounded by a solar canopy made of SunPower solar cells for exceptional energy efficiency. The iconic Living Roof is exactly what it sounds like. It’s really alive, covered in 6 inches of soil, native plants and a thriving population of birds and butterflies. It serves as both a green space and as insulation, aiding in the building’s heating and cooling efficiency. Automated louvered vents regulate temperatures inside the building, reducing dependence on the HVAC system while simultaneously acting as skylights that provide natural lighting inside the building’s public area. A beautiful solar canopy surrounds the living roof with 60,000 SunPower cells that supply 213,000 kilowatt hours of clean energy per year while preventing the release of more than 405,000 pounds of greenhouse gas emissions annually. The facility is the world’s first Double Platinum museum and the largest Double Platinum building in the world. Its first LEED Platinum rating was in the “New Construction” category, and its second was in the “Existing Buildings: Operations & Maintenance” category. Such projects are remarkable achievements, illuminating the path to a more sustainable way of building and daily life. 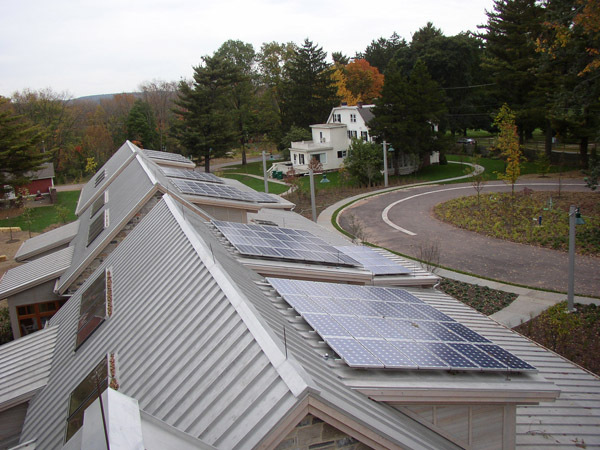 Won’t it be awesome when net-zero energy is a mainstream building approach? I like to think that day is very close at hand. But whether you are a world-renowned architect designing a landmark green building, or a young family using a modestly sized solar system to better manage electricity costs, we are inspired by your efforts. Every step counts toward achieving a brighter, sustainable future for all. © 2015 SunPower Corporation. All Rights Reserved. SUNPOWER, the SUNPOWER logo, and HELIX are trademarks or registered trademarks of SunPower Corporation in the U.S. and other countries. Cradle to Cradle Certified™ is a certification mark licensed by the Cradle to Cradle Products Innovation Institute. All other trademarks are properties of their respective owners. 1SunPower 327W panel with Helix DT compared to standard efficiency Conventional 260W panel and flat roof mounting system. 2Typical project assumes core and shell or major renovation with at least 10 percent of energy offset by solar, sufficient products to qualify for Material and Resource categories and 33 percent of hardscape covered with solar or other heat island reducing coverings.